A lot of people have been benefited with this 3 day diet plan already and if you’re just starting out, you might be having some doubts regarding the Military diet. So, in this article, we shall discuss the most commonly asked questions about the 3 day military diet plan. If you don’t know already, the Military Diet is one of the quick weight loss diet plans that help you lose 10 pounds in 3 days naturally, that too without any exercise. #1.How many days should I follow the military diet cycle? The diet plan lasts for 3 days and you should take 4 days off after completing the military diet. During these 4 days, you should aim to eat healthy. This 3 day diet + 4 day maintenance (7 days) cycle can be repeated as many weeks as you want or until you reach your target weight. #2.Is the weight loss just water weight? Many people mistake the low calorie diet with detox diet. When you’re on a detox diet, you body gets a lot of water with less amounts of salt (sodium). In such diets, you’ll lose a lot of water weight. But, the three day military diet not a detox diet and is a regular low calorie diet plan. #3.Can I repeat the 3 days military diet continuously until I lose all my weight? No! The 3 days diet should always be continued with the 4 day maintenance diet. You cannot just follow the three days diet and again repeat it. This would cause serious health risks as you’ll not be getting vital nutrients your body needs if you do so. Reason: Generally, people lose weight fast when they’ve limited their daily calorie intake. This is because our metabolism gets a shock and when you continue the same diet for more than 10 days or so, then it gets used to the low calorie consumption and stops reacting to your diet. Follow the 3 day military diet + 4 day maintenance diet (complete 7 days) and then repeat the process from day 8. If you do so, your body will not get used to the diet and then responds positively. #4.What should I eat during the 4 days off period? The four day off military diet is usually a maintenance period, which helps you maintain your lost weight and not gain it back. During these 4 days, you should be eating a healthy meal plan. Men should aim to consume 1500 calorie meal plan, while the women go down to 1200 calories per day. 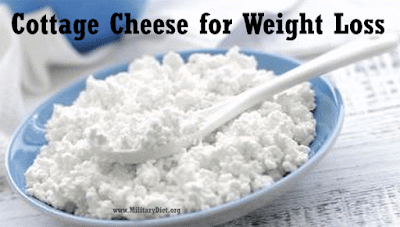 #5.How many calories does the military diet contain? The calories vary between 1100 to 1400 per day. For more detailed calorie distribution, see our calorie count page. #6.Is the Diet only for Women or Men can follow it too? Well, this is not any PCOS diet and every one who is trying to lose weight can follow it without any issues. There is no gender inequality in the military diet. #7.Can I add any sweetener to my Coffee? Yes, stevia is allowed. But, please stay away from any cream or sugar as it will only make the things worse. Instead, try to add honey, organic maple syrup, agave nectar or stevia. The Coffee is not generally considered one among the healthy weight loss drinks, but if you prepare it in some ways, such as the way on the Military diet, then it is healthy for you. 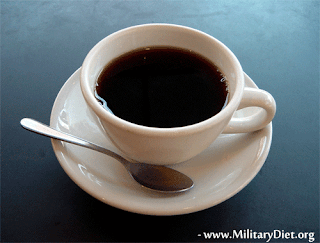 According to the military diet plan, it is suggested to drink your coffee black. According to the dietitians, Coffee is very rich in antioxidants and is healthy. But, it loses its nature once you add cream or any artificial sweetener. As everyone knew, fruits and vegetables are the best sources to get antioxidants. But, it is not always possible to munch on them and hence the coffee occupied their place. Make sure you prefer organic coffee over conventional coffee as it contains ample amounts of pesticides, herbicides and fungicides. Consumption of these harmful chemicals can cause hormonal imbalance in your body. Not just coffee, choose organic in every possible way for every food you eat. You can increase the default antioxidants count in your coffee by adding cinnamon, cloves, carob or unsweetened cocoa powder, all are healthy. Last, but not the least. Don’t get addicted to coffee. Try to have it only once or twice a day and not more than that. You can alternatively go for Green tea or Oolong tea, for which there is no limit on the consumption as they’re healthy. #8.What if I don’t like drinking coffee? Is there any alternative? Caffeine works as an appetite suppressant and gives a slight boost to your metabolism. Avoiding it completely may not bring any major differences in your results. And, the only beverage you can substitute it with is water. 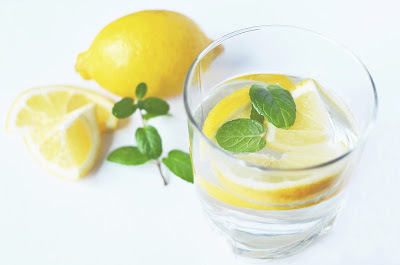 Boil a glass of water until warm (not hot) and then squeeze half of a lemon into the warm water. Drink it immediately before it cools down. You may also add a teaspoon of honey for taste, but it may add additional calories to your overall diet. So, better avoid it. For best results, try to choose organic lemons as they don’t contain harmful pesticides. And remember not to eat anything up to 10 minutes after drinking the lemon water. Despite the fact that lemons are rich in vitamins, minerals and immune boosting properties, you should also know that they’re also one of the best alkalizing foods. In reality, the acid in lemons create alkaline blood and it is proved that the people with alkaline body lose more weight and are less prone to inflammation. Not to forget the fact that they also improve your immunity. Because the lemons help in improving the digestive system and balancing the hormones, people who drink lemon water every day tend to lose more weight naturally. #9.Are Energy Drinks Allowed on the Military Diet? Well, the answer is NO! The energy drinks like Red Bull, Monster and Rock star make several mind boggling promises to the people that they get the ability/strength to lift the cars over the head or grow wings or become sexier. But, it is completely false. They simply contain carbonated water mixed with large doses of caffeine and high fructose corn syrup (sugar). So, if you’re thinking very high about these energy drinks, then do note that they doesn’t contain any magical powers. Caffeine: This particular ingredient is good, only if taken in small quantities. Unfortunately, Red Bull contains 80 mg of caffeine, 5 Hour Energy has nearly 200 mg of caffeine. So, consuming these energy drinks means you’re consuming high doses of caffeine, which is very bad for your health. In many cases of overdose, people usually suffer with increased heart rate, improper sleep levels and body dehydration. Hence, it is advised to either avoid these energy drinks or at least stick with 1 drink per day if you can’t control. Sugar: If you carefully look at the ingredients on the energy drink tin, you’ll find that it contains sugar in the form of high fructose corn syrup, which is 1000x worse than the regular sugar. It is said that an energy drink contains more than 15 teaspoons of sugar. The high fructose corn syrup goes directly to your belly. So, if you’re drinking these energy drinks assuming they give you wings, then better expect a round belly or muffin tops, as they’re popularly known. With no nutritional benefits and empty calories, you’re simply hindering your weight loss results. 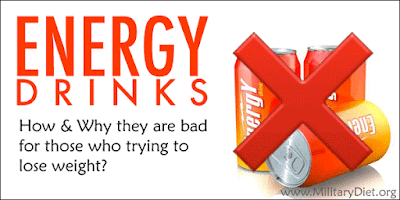 I know what you’re thinking now – drinking unsweetened energy drinks may be healthy! Isn’t it? Well, these artificial sweeteners like aspartame too contain their own problems. They give negative hormonal effects on your body, thereby creating a big fat belly in the long run. Also, don’t get fooled by the promises by the energy drink companies about their vitamins and amino acid variants. To identify the truth, simply check your pee color after drinking an energy drink. If it is bright yellow in color, then confirm that the tin contains nothing but fake vitamin B, which your body can’t use. Please remember that vitamins are best absorbed when came from natural foods and not these so called energy drinks. #10.Why am I not losing weight on the military diet? Well, there are many reasons why people don’t lose weight. Whether it is the army diet or any other diet for that matter. Here is a detailed answer – hormones responsible for weight loss. #11.Why am I losing less weight when compared to my first time? According to the science of weight loss, the more body weight you lose, the less calories your body needs. This would decrease or slow down the results if you follow the same diet with same calories per day. Say for example, if you weigh around 250 pounds, then your body probably needs 2500 calories per day. And, when you go on a low calorie diet like the military diet, you’ll lose weight pretty fast. After a while, you’ll weigh 200 pounds and your daily calorie needs too fall to 2000 calories per day. So, you’ll likely lose less weight than when you first started. The weight loss slows down as you get lean. So, the only way to overcome this situation is to increase your calorie burn through exercise or other physical activities. #12.Should the specified meal timings be followed as it is? We’ve listed the sample meal timings to suit general audience. But, if you’ve different lifestyle or work timings, you can have them at your own time. However, don’t make any changes to the menu (foods listed). Eat them without skipping. #13.Are snacks allowed on the military diet? Sorry! You cannot munch on snacks between the meals. If you crave for snacks, you can simply skip a particular item (ice cream/banana/carrots etc…) from your meal and have it during your snack period. No additional foods apart from the suggested list should be had during the 3-day diet. #14.Is exercise allowed during the military diet? During the first 3 days of the diet plan, you’re suggested not to include any strength training or strenuous workouts as you’ll feel dizzy or week due to the low calorie consumption. The only exercise recommended on these three days is either walking or slow running for 30 minutes. Of-course, you can practice Yoga and meditation, which doesn’t make you strain. And, on the remaining days, you can practice all workouts without any problem. #15.Can Yogurt be used as a substitution on the military diet? Yes, but first know the basics before going for it. Yogurt is a healthy food, and there is no doubt in saying so. But over the decades, thanks to those grocery stores, Yogurt has become hazardous with the addition of sugar content. It is not a surprise to say that some Yogurts, just like the full-fledged desserts, are not at all healthy. Since it contains artificial sweeteners, the yogurt has become unhealthy. We usually see in the commercials saying that the probiotics in the Yogurt make our guts healthy. But, it is not the case when you bought those store brewed yogurt, since not all probiotic yogurts are the same. When you add these artificial sweeteners to the yogurt, the sucrose kills probiotics, making it unhealthy. Of course, it is very healthy to eat probiotic yogurt as it helps in improving our immune and digestive system. But, what’s the use when you eat the sweetened yogurt, as the probiotics are already dead? To find out, you should carefully read the labels on the yogurt packs for any live/active cultures. It is said that the living yogurt is a lot easier to get digested than the regular milk products because the lactose content created by the microbes is reduced. An average yogurt found on the shelf typically contains 3 to 4 strains of probiotics per cup with 1 to 5 billion colony forming units (CFUs). So, if you’re looking to get the best benefits of probiotics, then you should look for a high dose. According to the experts, Kefir is very good for health. Since it is 99% lactose free, you get around 10 to 20 strains of probiotics and 7 to 50 billion colony forming units per each cup. #16.What’s the best advice to eat yogurt with? Most people assume that FAT is not good for health. But, you should know that there are good fats and bad fats. Yogurt contains good fats, and it is advised to eat Yogurt with fat, and add stevia, honey or fruits to make it even healthier. Consuming Yogurt with fat and fruits in the morning makes you full and helps you eat less during the day. Whereas the non-fat yogurt simply makes you crave for more as it doesn’t satisfy your appetite. #17.What is the recommended cooking method? If you can eat raw vegetables, then it would be great. Else, you can either steam or boil your veggies. When it comes to meat, you can bake or grill it with little olive oil. #18.Can I add seasonings to the military foods? Of-course, you can. But, they should be zero calories (extremely low in calories). Here is the full list of seasonings for military diet. 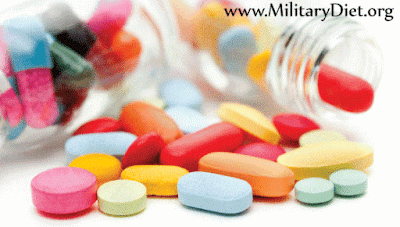 #19.Can I take Multi-vitamins while following the military diet? Yes, you can. Please read more about taking vitamin supplements on the diet. To get the answer, ask yourself the following questions. Are you eating a well-balanced diet that includes fresh fruits, vegetables and whole grains? Are you confident that your diet meets the daily nutrient values? If your answers to these two questions is YES, then you probably don’t need to take a multivitamin. The doctors generally suggest multivitamins to those who’re leading an unhealthy or unbalanced lifestyle routine as these supplements will fill the missing or necessary vitamins and minerals. Based on these facts, don’t get to a conclusion that a multivitamin is your next big thing that can save you from becoming ill. Even though you’re taking these supplements, you can’t expect to stay healthy by eating fast foods as part of your meal. It is just a health or dietary supplement that stands as an add-on or booster and not as a replacement to a healthy balanced diet. Multivitamins contain 100% of the daily recommended quantity required or needed for your body. They help in improving the immunity system, bone health and reduce the risk of cardiovascular and chronic diseases. You can find hundreds of brands in the market, providing multivitamin supplements either in tablet or powder form. However, it is important to choose the trusted brand to get the promised benefits. Also, pick up the product according to the gender and age, because you’ll find separate multivitamin supplements designed for kids, pregnant women, men, women and seniors. My suggestion would be to purchase the supplements only after consulting your doctor as high doses of multivitamins can do more harm than good. The doctor may suggest enough dose based on your current diet plan. #20.Should I Eat Eggs during the Diet? Doesn’t the Yolks Rise Cholesterol? A lot of bad publicity is created by the press saying the Eggs are bad. But, in reality, eggs are very healthy and they’re included in the military diet mainly because of their fat burning properties and high nutrient value. 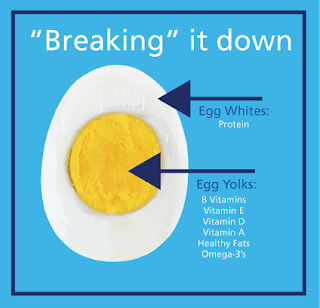 It is also wrongly said that the Yolk is the unhealthy part of the egg. If you carefully look at the nutrient value, you can find that the yolk is high in nutrient density as it contains vitamins A, B, folate, calcium, iron, omega-3 fatty acids and many more. Throwing the yolk from an egg is like trashing the prize you find in a kinder joy egg. In this instance, you should also know that the egg whites are neither tasty nor nutritious, but of course, they’re low in calories. Yes, egg yolks do raise the cholesterol levels, but only the good cholesterol (HDL). At the same time, they control your bad cholesterol (LDL) and thus lowers your risk of getting heart diseases. Despite the claims made by the pharmaceutical companies, high cholesterol is not a disease, if it is HDL. Normally, heart diseases are caused by inflammation and not due to dietary cholesterol. Fortunately, the antioxidant ‘lutein’ which is present in the yolks helps our body from inflammation, thereby saving us from heart diseases. It is to be noted that the actual role of cholesterol is to serve the vital body functions. Yes! if you’re worried that eating eggs will make you fat as they’re caloric in nature, then do know that they’re as well rich in nutrients and burn fat in your body. Below are a couple of reasons why the whole eggs are included in the military diet. The egg yolks contain healthy fat, which is responsible for maintaining the fat burning hormones in our body. Thanks to their nutrient dense nature, eating egg yolks helps in regulating the appetite so that you don’t overeat during the day, thereby helping you consume less calories and lose weight eventually. Here is a recent study on two different groups of people. Group A has been given only eggs for breakfast, while the Group B was allowed to eat grains including cereals, bagels, toast. The final result surprised everyone. The people who ate eggs for breakfast (Group A) have lost or maintained their weight, while the other group (B) gained weight. The reason behind this is that our blood sugar levels won’t get affected when we eat eggs, but it is otherwise with the bagels or fruit loops. So, people who ate eggs felt fuller for longer periods, thus consumed less calories and lost weight. #21.Is alcohol allowed during the diet? NO! Alcohol or any soft drinks are not allowed if you wanted to lose weight as they contain empty calories (just calories and no nutritional value) and thus make you gain weight instead of losing it. #22.What can I substitute the military diet foods with, if I don’t like them? Don’t like grapefruit? You can mix ½ tsp of baking soda in a glass of water and drink it. Don’t like Tuna? No problem! Just replace it with cottage cheese or chicken or tofu or almonds or peanuts. Not many like bananas, right? Simply, substitute bananas with a cup of papaya or 2 kiwis or 2 apricots. Visit our page for complete list of Army diet substitutions. #23.How Does Cottage Cheese Helps in Losing Weight? Cottage cheese is also said to be the best alternative for those who’re craving for sugar. It keeps your sweet tooth at bay. You can include the Cottage cheese in any of your meals. But, I personally prefer to have it during breakfast and sometimes as a snack. It is usually a healthy habit to include protein in every meal, especially in your first meal of the day i.e., breakfast. Because, that is when you cut the long fasting period and it should be high in protein and also calories. A healthy breakfast will give you a boost for the rest of the day, or at least until your lunch so that you don’t have an unhealthy snacks before the second meal. Just add the cottage cheese in a blender and make a smoothie. Apply this on the bread to make a toast. This takes too good, believe me. For low-calorie dieters, whole wheat bread is the best choice over the white bread. If you’re eating veggies with a dip (cream), then you can replace that cream (high in calories) with the puree made using cottage cheese. This will save you a lot of calories and it is also high in protein content. Add the following ingredients to a blender and make the puree. The regular Ice cream contain a lot of calories and is also high in sugar content, which spikes your insulin levels. So, it is better you prepare you own dessert at home, which is both healthy and tasty. Add the following ingredients in a blender and blend well. This is one of my favorite desserts these days. It tastes so good that I totally forget eating desserts outside. #24.Can I Eat Protein Bars to meet my Protein Requirements? 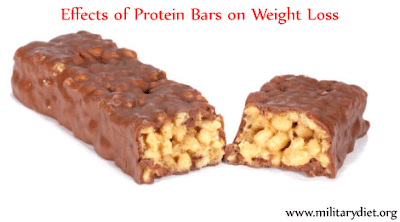 The majority of the protein bars which you find in the grocery stores contain too much sugar, trans fat, highly processed soy protein isolate, artificial sweetener, color, additives, artificial flavor, heavy calories and a lot of other chemicals that can’t even be pronounced. A lot of these ingredients are also found in the junk foods we eat on the streets and places like McDonalds. So, how good are these protein bars compared to the junk we eat? If you want to know the real truth, then you should first know the ingredients used in the protein bars. Corn Syrup: The worst and the major ingredient of all is the sugar in the form of high fructose corn syrup. Since the fiber and other healthy ingredients don’t taste so good, these protein bar companies try to hide the taste by adding too much of sugar content. So, when you eat such high doses of sugar, you’re doing your body nothing but harm. The artificial sweeteners, artificial flavors, colors, additives etc…are a cost cutting measure by the manufacturers as they’re a lot cheaper than their original counterparts. The labels you find on the protein bars may claim that they’re a healthy food, but it is a false claim, all thanks to the loose labeling requirements from the FDA. So the next time you’re eating a protein bar thinking that it would improve your health, please be aware that you’re doing only harm to your body. #25.Can I drink honey-lemon water in the morning? Avoid honey and drink just warm water with lemon juice. It gives you the similar results without adding extra calories in the form of sugar. #26.I am a vegan. Is there any vegetarian meal plan for me? Of-course, yes. Here is a detailed vegetarian military diet plan. #27.Will I gain weight back once I finish the three day military diet? Yes, you’ll gain weight if you’ve returned back to your regular unhealthy eating habits without minding the calories. No, you’ll not gain weight if you follow a healthy low carb high protein diet. This scenario is not just applicable to military diet followers, but everyone who is trying to lose weight with dieting. Always, remember that there is no permanent fix/solution for weight loss. The only way to not gain weight back is to maintain it. #28.Can people with diabetes follow the military diet? No! People who’re suffering with diabetes, heart problems and hypertension will have special nutritional needs. And so, this 3-day diet is not meant for them. Please consult your dietician for a customized diet plan for your needs. #29.Does Military Diet reduce my belly? First of all, please know that ‘Spot reduction is a myth’. You’ll lose weight by following the army diet aka ice cream diet. But, you’ll lose it from your overall body and belly is also one area.